The Railway is one of Blackheath’s favourite meeting points and caters for all occasions, from the swift couple after-work to a full-on food and entertainment experience. 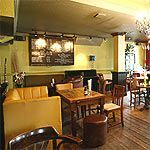 It consistently delivers to its patrons and has a well-deserved reputation for providing a broad range of beers, wines, wholesome food and a relaxed, enjoyable atmosphere. 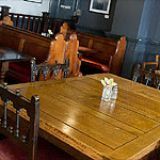 A short walk from Blackheath station, and with several car parks and a bus stop nearby, there is no reason to miss out on the fine pub experience provided by The Railway. A busy bar area is complemented by an elevated dining space looking out onto Blackheath Village. 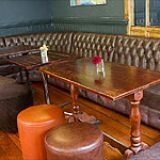 This spacious venue boasts several cosy pockets of seating throughout the pub where friends and family can chew over the events of their day in a relaxed, sofa-laden setting. Garden seating and a roof top terrace are the hidden gems which are on offer to those with local knowledge and elevate the experience of lucky first time visitors. 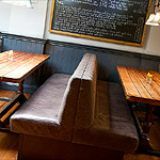 Quiz nights and live music underline the multi-dimensional offering at The Railway and it is no surprise to see all ages and professions sitting and standing side by side. The Railway delivers on its food. Hearty portions, well cooked and carefully presented keep the patrons happy and it is always a joy to see the breadth of a good menu being enjoyed on the tables around you before placing an order. There is a prix fixe menu during the week offering two courses for £10 or a three course menu for £13. The a la carte menus are drawn up on a daily basis and the staff are helpful, efficient and forthcoming with recommendations based on their own experience of actually eating the food. The smoked salmon starter (£5.75) provides layers of freshness and a quirky beetroot crème fraiche dances lightly with the lemon-infused crispy salad. The toasted rye bread adds extra crunch to this winning ensemble. The main menu boasts several show stealers and it is clear to see that the handmade West Country beef burger (£9.25) topped with mature cheese, smoked bacon and chips is a local favourite. In addition, the 21-day aged 10oz rib-eye steak with roasted cherry tomatoes and rosemary chips (£15.75) is the perfect antidote to a hard day in the City. Another favourite is the beer battered haddock and chips with minty mushy peas and tartar sauce. At £9.75 it comes in a whole 5p cheaper than the local chip shop which, given the enjoyable buzzy atmosphere of The Railway, is extremely good value indeed. They also have a good reputation for their Sunday roast dinner with all the trimmings, which weighs in from a very reasonable £10.90. The generous starters and main meals set the customer a real challenge when it comes to the pudding menu. While the stomach is saying “full” the heart and mind are deciding between the lemon posset with shortbread (£4.50) or the sloe gin Eton mess (£5.25). After some debate a delicious late rally from the sticky toffee pudding with vanilla pod ice cream wins the day, at a nice round five pounds. The Railway stocks all the recognised brands of beer and has 21 different types on draught as well as a full range of bottled and organic beer. This partly explains the popularity of the standing area around the bar although the young lively staff are most definitely a contributory factor. The wine list has a popular range of old and new world wines to satisfy most tastes. Chardonnays, pinot grigios, Australian shiraz and Chilean merlot occupy many of the tables, as both young and old get woozy and contribute to the lively buzz of this very good venue. If you live in Blackheath, make The Railway your local. 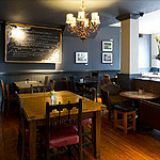 If you work in Blackheath, make The Railway your local. If you are travelling into town for a night out, start in The Railway and don’t be surprised to end your evening there.